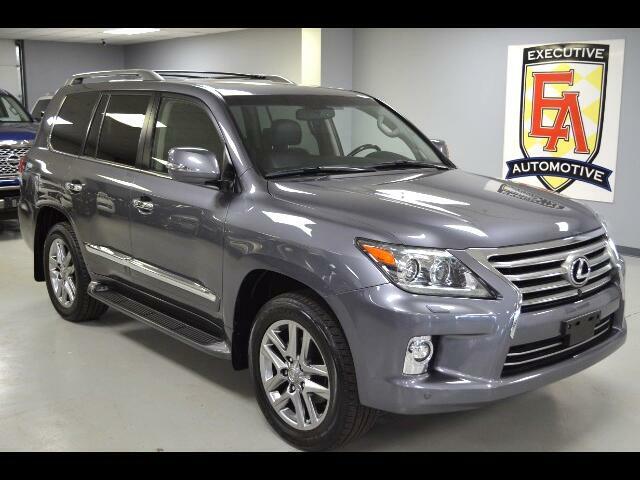 2015 Lexus LX570, Gray with Black Leather, Options Include: Dual-Screen DVD Rear-Seat Entertainment System with Wireless Headphones, Audio/Video Inputs. Intuitive Park Assist with Wide-View Front and Side Monitor. Luxury Package Includes: Leather Trimmed Interior with Contrast Stitching, Heated/Cooled Front Seats with Second Row Heated Seats, Heated Steering Wheel, Center Console Mounted Cool Box, Smart Access Card Key, Wood -Trimmed Door Switch Plate/Rear Center Armrest Cover. Mark Levinson with 19 Speakers Surround Sound Audio System Featuring DVD Audio and DVD Playback. Remote Engine Start. NAVIGATION SYSTEM, BACK-UP CAMERA, POWER TILT AND SLIDING MOON-ROOF, AUTO LEVELING HEADLIGHTS, BLUETOOTH CONNECTION, STEERING WHEEL AUDIO CONTROLS, POWER FOLDING THIRD ROW, KEY-LESS ENTRY, PUSH BUTTON START, DRIVER AND PASSENGER ADJUSTABLE LUMBAR, RUNNING BOARDS, FOG LIGHTS, ELECTROCHROMIC REAR VIEW MIRROR, BRAKE ASSIST SYSTEM, REAR SPOILER, REAR A/C, TURN SIGNAL MIRRORS, UNIVERSAL GARAGE DOOR OPENER, POWER WINDOWS, POWER LOCKS, POWER MIRRORS, POWER TILT, POWER LIFT-GATE, POWER FOLDING MIRRORS, POWER SEATS (both) and more! Contact Kyle Porter at 816-616-2500 or email kyle@executiveautomotive.com for additional information. Thanks for your interest in our LX570! Message: Thought you might be interested in this 2015 Lexus LX 570.